The Beko DFS05010W is a slimline dishwasher which is just 45cm wide but still has the room to be able to hold up to 10 place settings of washing, so you can load all the dishes in a single load. To make loading easy the upper basket is fully extendable and can also be adjust so you can fit larger item in the bottom basket. In the bottom basket there is a cutlery basket with can be removed for easy loading and unloading. There are some great programmes to select from to make sure your dishes are cleaned properly. If you are in a hurry then you can select one of the two quick wash programmes, a 30min or a 90min wash depending on how dirty your dishes are. Not used many dishes today? Not to worry use the half load option and save between 10-25% on energy costs. 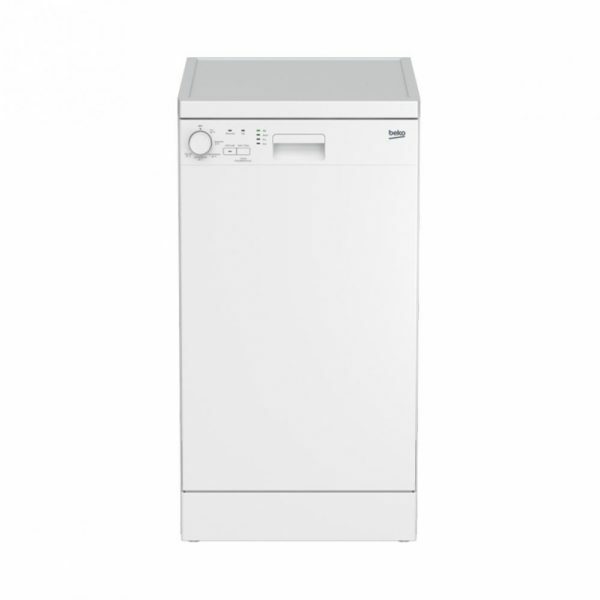 The Beko DFS04010W has been rated A+ for energy efficiency.